Friendly, candid and measured, Guthrie talks me through an action-packed career which belies his young years. From his first ever goal for Southport, (“a deflection”) to lifting a championship with Welling United (“the best group of lads”), this is the FGR star’s story, in his own words. DB: Growing up in Jersey, were there many footballing opportunities for youngsters on the island? And who did you support, either locally or further afield? KG: There weren’t really many opportunities, no. At ages 14 and under, there are a few tournaments, but no real opportunities to push on from there. I would love there to be more for the kids. In Jersey, I think there are a lot of technically sound, very good young players – but it’s hard to get used to the physicality you can get in football. We weren’t getting to play against boys from the mainland. I didn’t really support a team. In Jersey, it’s all local clubs. My favourite club in Jersey is St. Clement. I played for them when I was younger, and then when I started in mens football. Over [in England], I’ve just always enjoyed watching good football – whoever the teams are. DB: In 2009, you broke into the first-team for St. Clement, who are in the Jersey Premiership. You scored almost a goal a game for the club, which is an amazing ratio. How did you manage to adapt so quickly to physical senior football, at just 16? KG: I always enjoyed playing football above my age group. I started playing u-12s when I was about 8 years old, and a couple of years later, for the u-14s. When I reached 16, I didn’t really enjoy playing with people of my own age – I was excited by the challenge [of mens football]. I was always quite tall as well, so I could handle the physical side of the game. I found the transition easy, really. I didn’t find mens football too difficult, and I preferred it to playing with people my age. And the better the players around you are, the better you play too. As a young player, I think the quicker you can start playing senior football at any level, the better stead it will stand you in. Playing in the park with my friends had become a bit too easy! Anyway, I spoke to my Dad about ‘playing up’ for the mens team, and he encouraged me to. I’d been at the club for a while, so everyone at the club knew me and what I was capable of, and they were happy to throw me in. DB: In 2011, you joined League Two side Accrington Stanley. How did the move come about? And what were John Coleman and Paul Cook like to play for – each were in charge for part of your year at the club? KG: When I was 17, I moved to Trinity – another club on the island [of Jersey]. Whilst I was there, there was a bloke called Eamonn Elliott, who had played under John Coleman some years back. He told me ‘you deserve a chance in England’. I’d had that said to me before, so I didn’t really take note of it at first. By then I was working – doing my apprenticeship as an electrician – and I’d almost given up the hope of breaking into professional football. As that season ended, I got a phonecall from Stanley, saying they wanted me to come over and I went over there. After about 10 days there, the club offered me a deal, and I took it! It’s hard to judge those managers, because I feel that I was stitched up a bit by the club. I was told that Stanley were bringing in another striker, for me to learn from, and I signed under that pretense. That never happened, and I played up front on my own throughout. John Coleman did try and help me to adapt, but when Paul Cook came in, we just didn’t get on. I’m not sure why, but I do think we’re completely different people. About four months before the season ended, Stanley told me I was going to be getting a new contract at the end of the season, and then a week before it ended, Paul [Cook] pulled me into his office and just told me ‘I don’t want to give you anything’. For me, it turned out to be a blessing in disguise. I didn’t feel I was improving at Stanley, because I didn’t have the support system I needed. 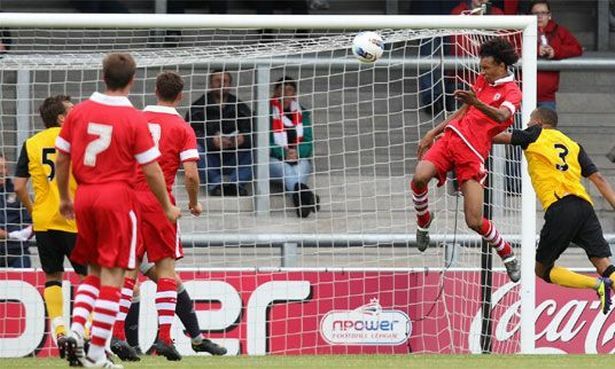 Kurtis in action during his season with Accrington Stanley. DB: You’ve almost answered my next question, but I’ll ask it anyway! Stanley sent you on loan to Southport for part of that season, and didn’t renew your contract at the end of the campaign. Do you feel that you were given a fair chance to prove yourself at Accrington – or not? KG: I do think a lot of the reason that period didn’t work out was down to myself, as well. I didn’t have that guidance, and had I known what I know now, I would have looked to go on loan somewhere else – preferably for 6 months. At Southport, I only started 3 games and came on as a sub twice. I was only there for a month, so I should have gone out on loan again, or even extended my time at Southport. I take responsibility off my own bat, but for financial reasons, a club like Stanley – at that time – couldn’t give me the support you need in the situation I was in. DB: Whilst at Southport, you got your first goal in the English game – a vital equaliser in a 2-1 win over Alfreton at Haig Avenue. What are your memories of that crucial strike? KG: I remember the ball coming over, I took it down and came inside, and then shot towards goal with purpose. It took a deflection, but it went in! It was obviously a nice feeling, but I think at that time, I only appreciated the experience for a moment. It was the same when I made my [Accrington] debut away at Northampton. I don’t think I realized the magnitude of those moments. I was just a lad who’d come over from Jersey, wide-eyed, just wanting to play football. It’s a shame, because I look back now on some of those early moments and how much they should have meant, and I think I took them all for granted – because I didn’t know any better. DB: Talking of goals, you scored a hat-trick on your debut for Bath City in 2012, against Maidenhead United. You had a very successful few months with the club. Did you enjoy your time at Twerton Park – and did you consider staying with the club long term, before the Welling move came about? KG: Obviously the hat-trick was a nice moment for me, and I was fortunate to have my sister – who was living in Bath at the time – there watching. KG: I’d played briefly for Welling in pre-season, before going to Bath – and so I’d already met quite a few of the players. I was also living in Peterborough, when I signed properly for Welling, and ended up carpooling with the captain, Lee Clarke, so I was instantly made to feel welcome. The Welling boys were the best group of lads I’ve ever had the pleasure to work with. That team spirit was something I’d never experienced before. Obviously Welling isn’t a club with lots of money, so Jamie had brought together lots of players who loved playing football and wanted to work hard for each other. Jamie knew that money wasn’t what motivated us – the guys in the squad were motivated by one another. It was just like playing with 18 of your mates! I think that spirit is what won us promotion. In terms of individual players, we probably didn’t have the best team in the division, but we had the best collective team unit. We knew one another’s strengths and weaknesses, and how best to work together. We won the title away at Boreham Wood, in the penultimate game of the season. We went there needing a point, and every one of us in that changing room beforehand just knew that this was the day Welling would be promoted. We drew 1-1 and did it! Our last game of the season was at home. Knowing we’d already won the league, and playing in front of our own fans was a great experience. Welling may not have loads of fans, but they’re loyal supporters who sing their hearts out. They’re fans that any player would be happy to play in front of. DB: At Welling you picked up a fair few yellow cards, but you’ve still never been sent off in your career – as a player, do you have a strategy for being able to be quite a tough, imposing player and taking the odd foul for the team, without stepping over that line and getting sent off? KG: It’s difficult. I feel that I get punished a bit on the pitch by opponents. I always seem to end up in the wars, so I make sure I give out my fair share as well! That means sometimes getting booked, of course. I’m on four yellow cards so far this season – so just one away from a ban. However, if you’re a player who puts yourself in where it hurts, sometimes the decisions are going to go against you. It’s a physical game at this level, and everyone knows that in the National League, you have to do the ugly side of the game sometimes – and with that comes a few bookings or even sendings off. A familiar sight: Kurtis in on goal for Welling United. DB: The Wings finished 16th in the club’s first season in Non-League’s top tier. One of your teammates in that side was Loui Fazakerley, who’s now manager of the club. Did he strike you as someone who was destined to end up in the dugout, or were you surprised? KG: That season was a funny one. Up until Christmas, we were in the top ten, and then we picked up a few injuries, whilst a few boys got moves to other clubs. DB: Did you have quite a small squad? KG: Yeah. Financially, we couldn’t hold onto those players. If the club had some more financial backing, and could have brought in a few more players to fill the void when we had exits or injuries, it would have been a completely different season. And ‘Faz’? First and foremost, he’s a great bloke. He’s also very into his fitness, and has always been a model pro. Within the younger players, there would always be someone that he would look to and try and help them along. He doesn’t demand respect – he just gets it. I wasn’t at all surprised to see Loui step into the manager’s job at Welling. It’s a great opportunity for him, and a great fit for the club as he knows the place very well, and has been at Welling for years. DB: You joined Forest Green Rovers last summer. How did you find the transition from part-time to full-time football, and more importantly, how did you cope with the fact there’s only vegetarian food on offer at the ground? KG: [*Laughs*] The transition from part-time to full-time football felt strange, but I’d already done it once – when I joined Stanley. At Welling, we trained three mornings a week, in my second year. So it was only adding an extra day. The tougher thing was trying to up my intensity levels. I think some players make out that the transition [between part-time and full-time training] is a bigger deal than it is. It’s been nice to be in full-time again. As soon as I joined Forest Green, I vowed that I wouldn’t take it for granted, and I don’t feel that I have. The veggie food there isn’t really for me. I just make sure I eat big before I go to training! DB: You had an excellent first season with the club, finishing with your best total yet – 8 goals – as well as more than a few assists. In which ways do you think your game has developed with FGR? And are there areas you still need to improve in? KG: The team did admirably last season, and we achieved Forest Green’s highest ever finish [5th place in the Conference Premier]. As for myself, I didn’t really play much in the first half of the season – it was more of a bit-part role. But once I got my foot in the door, I didn’t look back and have just kept pushing on. I think the training here has helped my all-round game. [FGR Manager] Aidy Pennant has been good with me, and I’ve also been patient because I’ve had to wait my time to prove what I could do for the club. I feel like when I joined, people were saying ‘who’s this? He’s just another young lad’, but I think if you asked the fans now, they’d say I’m an important part of the team. I feel I’ve deserved credit for keep working hard, but the coaching staff have been brilliant. Aidy, and now Jamie Day [who joined in May 2015] have helped me to continue improving this year. DB: Forest Green are currently top of the National League, though results have been patchy since that incredible start to the season. How confident are you of winning automatic promotion? And do you think the team can learn from some of the recent draws and losses? KG: I’ve always said that clubs are at this level for a reason – and that reason is inconsistency. When you step up to the Football League, I think the clubs there are a bit more consistent. I feel this is the weakest the Conference has been for a while. We won nine games on the bounce, but I don’t think we even played our best football in those early games. And then we got just one point from the next four games, and yet stayed top of the table. At the moment, we’re going through an unfortunate patch, but the performances and results will definitely pick back up again. So I think ‘why can’t it be Forest Green this season?’. Celebration: Kurtis and Lee Hughes (left) celebrating a crucial goal for Forest Green. KG: Keanu Marsh-Brown is another, since he’s come in. Keanu has so much flair and he can open up defences. Aaron O’Connor also has that deft finish, and a lot of experience. They’ve both been great additions to the squad. Then Darren Carter coming has given us that old head in midfield, and an ability to control games – alongside Rob Sinclair, who’s technically brilliant. So I think we’ve got a good chance [of automatic promotion]. DB: In terms of the atmosphere, the ground and even the numbers of fans Forest Green take – where is your favourite away trip in the league? Is there an away day you always look forward to? KG: It’s a tough one that! [*Pauses*] I like going back to Welling. I have good memories of being at the club, and even though last year I only played a couple of minutes there, I enjoyed it. This year I’m looking forward to going back. It’s a Tuesday night game [10th November]. I always liked midweek games at the PVR* [*Park View Road]. Tranmere should be a good one this season, too. I’m also looking forward to going to Halifax because last year it got a bit heated, so I’m hoping to go back this season and get revenge! DB: Though you’ve already had a lot of experience in the game, you’re still only 22 and have a long career ahead of you. Do you see yourself with Forest Green in the long-term, or is the endgame to join a big Football League club? KG: That’s difficult, because I feel Forest Green is the best club to be at, at this level. The club offers everything you need, and the facilities are excellent – absolutely second to none. Still, I’ve always dreamt of being able to play in front of big crowds, every single week – and I feel that big crowds actually bring out my best performances. It’s just unfortunate for Forest Green, that the location [Nailsworth: population 5,794] means they can’t generate those big crowds. I don’t think there’s any other way in which the club needs to progress, other than getting bigger crowds. There’s talk of moving to a new stadium, and maybe that could be the turning point on that front. DB: Finally, what do you enjoy doing outside of football? I know you have a sporty family – with your sister playing for the England netball team. And is there a career you ever considered aside from playing the beautiful game? KG: I’m a bit of a couch potato to be honest, mate! I like watching films and just relaxing, really. I do play a bit of golf in the summer. I’m a seasonal golfer, I don’t really fancy it in the winter! Because of the work I did before I played football for a living, if anything was ever to go wrong, I think I’d turn to painting and decorating because it’s just something I know. I think I’d like to work for myself – not taking orders from people. I’m quite an independent guy. I’d only stay in football if there were the opportunity to do youth coaching, like u-14s. When I go back to Jersey, I like watching local football, because there’s always that one player who’s better than everyone else. You can always spot them, and I’d like to help kids in Jersey get over to football clubs in England more, and expand the market of players in Jersey. Guernsey are doing their own thing in the league, but the standard of players in Jersey is far better. If there was the opportunity, that’s something I’d like to look at doing once I finish playing. 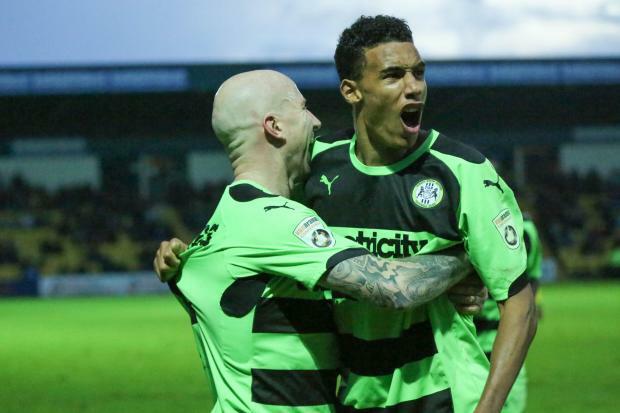 Posted on October 22, 2015, in Dave Burin Interviews, Forest Green Rovers and tagged Accrington Stanley, Featured, FGR, Forest Green Rovers, Interview, Kurtis Guthrie, St. Clement F.C., Welling United. Bookmark the permalink. Leave a comment.